The insurance sector has always played a crucial social and economic function in covering the risks of individuals and businesses. This familiar role dates back to the first millennium BC, when groups of merchants in Rhodes conceived a ‘general average’ that consisted of premiums to protect those whose goods didn’t make it through a voyage. In the present setting, the role of insurers has undergone a rapid transformation over a remarkably short period of time. A key factor is a sharp change in the kinds of risks that people are facing: while cybercrime is on the up, autonomous vehicles could dramatically reduce vehicle-related risks. Meanwhile, products are becoming increasingly personalised and efficient, while simultaneously expanding to fulfil new functions. Notably, technological advancements like big data, smartphone usage and the Internet of Things are shifting the foundations of the industry, while social and economic changes are driving new opportunities for growth. According to PwC, insurance is the industry that has been most severely impacted by disruptive change, based on the percentage of CEOs who are “extremely concerned about the threats to their growth prospects from the speed of technological change, changing customer behaviour, and competition from new market entrants”. As ever, success will come to those who are readily equipped to adapt to the wider social, economic and technological trends that are driving the market. 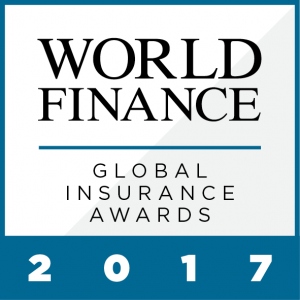 Against this backdrop, World Finance has carefully selected the most impressive companies from across the industry for the 2017 edition of the Global Insurance Awards. While the economic recovery in the US and EU is increasingly convincing, global growth continues to be littered with uncertainties and potential setbacks. As a result, insurers today are facing the ongoing challenge of considerable uncertainty in the global economy, coupled with the burden of various regulatory pressures. Another important issue facing insurers is the continued low-interest-rate environment, which is putting pressure on investment income. Deloitte’s report notes that, while the industry as a whole started 2017 with a strong financial base, profitability is being undermined by excess capacity. This can be illustrated by a downward trend in net income and a lower return on average equity. Furthermore, this problem of high capacity is unlikely to shift anytime soon given stiff competition from new and existing players and a background of slow growth. One stark change facing insurers today is that customer loyalty is an entirely different game to what it once was. Online customers now approach insurance decisions with the helping hand of an array of new aggregators and digital comparison tools, and their choices are driven more than ever by price. This was put into focus by Accenture’s 2017 global distribution and marketing consumer study, which questioned 32,715 insurance customers across 18 markets to get to the bottom of what is driving their choices. According to the study, 52 percent of vehicle insurance customers say that competitive pricing is their number one driver of loyalty, though this dipped slightly to 50 percent for home insurance customers and 38 percent for life insurance customers. Inevitably, the commoditisation of insurance is revving up price competition and forcing companies to drive down costs by turning to digitalisation and technology-based solutions. This is leading to increases in the use of automation for applications such as data collection, analytics and online customer interactions. Notably, this shift in the notion of loyalty is also creating new opportunities and growth areas. In order to woo customers, insurers are moving towards more personalised services and modern tools of big data, mobile phones and advanced analytics to tailor the customer experience. This has led to an emerging market for usage-based insurance, which has scope to expand from vehicle insurance into home and business insurance. Illustratively, around a third of insurance customers interviewed by Accenture indicated that they were interested in receiving vehicle insurance that adjusted to individual usage. Meanwhile, 44 percent of insurance customers conveyed that it was important to them for insurers to provide personalised health advice. The logic to be derived from this survey data is that those companies offering novel ways to engage customers will be able to retain some loyalty and escape the relentless race to the bottom. Another key development in the insurance sector is the growing threat of the cyberattack, which looks set to stimulate a large quantity of new business. Over the course of last year, notorious cyber disasters like WannaCry and Petya have ensured that companies and individuals are fast waking up to the potential for loss and inconvenience. Smaller-scale cyberattacks are also becoming increasingly common. A government survey of businesses in the UK found that 66 percent of medium-sized businesses claimed they had experienced a cybersecurity breach or attack over the course of the past year. This is relatively unknown territory, however, and the numbers that insurers are grappling with are largely unfamiliar. For instance, questions around severity, financial loss and reoccurrence risks are still difficult to quantify. One report, which was co-written by Lloyds of London and risk modelling firm Cyence, has sought to identify just how devastating a cyberattack might be. In exploring the potential for damage, the report modelled a hypothetical hack of a cloud services provider. It ultimately found that such an attack would result in drastic economic losses ranging from $4.6bn to $53bn, while in the most extreme cases, losses could rise as high as $121bn. At the top end, these losses would be on par with those inflicted by some of the most extreme natural disasters. Ironically, the very same trend will also be a danger to insurance companies, as they inevitably face the task of building their own defences against cyber risk, particularly if they find themselves sitting on large quantities of usage-tracking data. Meanwhile, Deloitte also warns of a creeping “existential threat” facing insurers: self-driving cars. Autonomous vehicles could feasibly result in tens of millions of people eschewing the need for car insurance, which would of course be devastating for the industry. As ever, technology is both friend and foe: it is forcing change while also simultaneously creating an arena for certain firms to stand out more than ever. The World Finance Global Insurance awards aim to celebrate those that have stood out as clear industry leaders over the course of 2017 by remaining agile even in the face of rapid change.